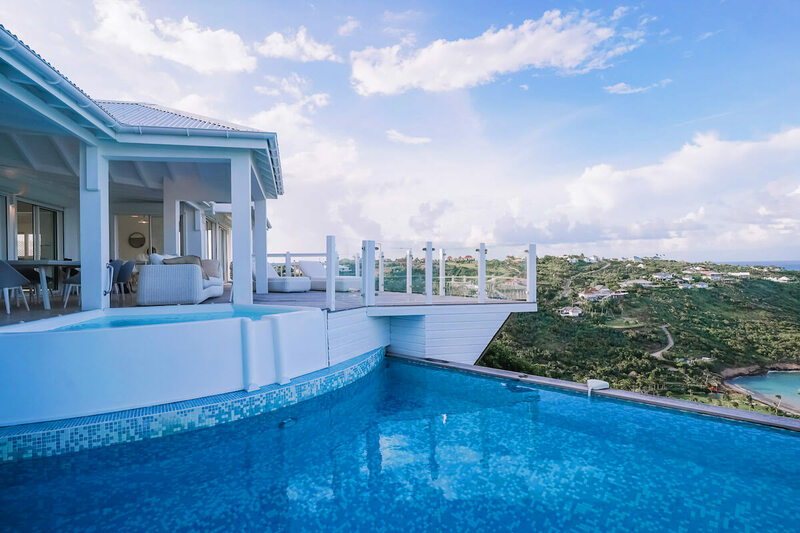 This villa offers views from nearly every corner, including a clear shot of the waters below from the large, private pool or from the Jacuzzi tub. A sprawling deck encircles both with plenty of seating for up to eight guests. Children over the age of eight years are welcome and will find much to do. Just one minute from the Marigot Beach, Milonga Villa is conveniently located and offers many of the comforts of home including air-conditioning, satellite television, and internet access, yet is set in a tropical paradise. A fully equipped kitchen and barbeque grill make meals a cinch, so guests can enjoy every moment of their stay. Views of Marigot & Grand Cul de Sac Bay from the large pool deck..
At Milonga Villa, modern decor enhances this new establishment in Marigot. It is tastefully decorated and features views of Marigot and Grand Cul de Sac Bay from the large deck and bedrooms that open out onto the pool. Milonga Villa has living and sitting areas, as well as a covered terrace with a Jacuzzi. Gas BBQ, US Satellite TV, outside kitchen next to the pool, parking, and garden; beach chairs, beach umbrella, cooler, beach towels. One minute drive to beach (Marigot).